Fried fish is so boring. Battered fish is much better but Beer Battered Fish is the best! This recipe needs no long talk, just go and make it then send me a feedback. That's how sure I am that you will love it. You will not use up the whole can of beer, just enough to make the flour mixture like pancake batter. You can also use sparkling/carbonated/gaseous water to achieve the light and crispy effect but be rest assured you are not getting the same taste. The salt in gaseous water may even ruin the taste. The alcohol in the beer escapes during frying hence this snack is alcohol free. You can use non-alcoholic beers to be completely sure. You can prepare this small chop with your favourite soft fish with soft bones such as Mackerel (Titus), Cord, Panga, Pollock etc. Use your favourite seasoning. I only use stock cubes, ground cayenne pepper and salt. Cut the fish into thin slices, say 1 cm thick. You want the fish to be done by the time the batter is crispy. Crush the stock cubes and mix with the ground pepper. Season 2 tablespoons of flour with the stock cube/pepper mix. Set aside. Season the fish with the same mix and set aside. Set some vegetable oil on the stove to heat up. The oil should be 2 to 3 inches deep. Put the remaining flour in a separate bowl. Add some of the seasoning mentioned above. Add small quantities of beer at a time to the seasoned flour and mix as you go till you get a light flowing batter similar to pancake batter. 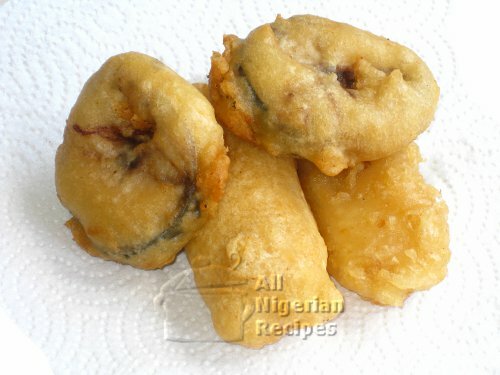 When the oil is hot, dab a piece of fish in the seasoned flour making sure that the flour covers all the fish. This helps more batter adhere to the fish. Dip the dabbed fish in the batter making sure all parts of the fish are covered before putting it in the oil. Repeat the process for as many pieces of fish your frying container will allow without overcrowding. Fry at medium heat till light brown and crispy. Put in a paper lined sieve to drain. Serve as a small chop or with potato chips and any drink of your choice. Yummy!